Welcome to this week’s round-up where I bring you a selection of productivity, wellness and organisational news, as well as a bit of fun for your Friday. 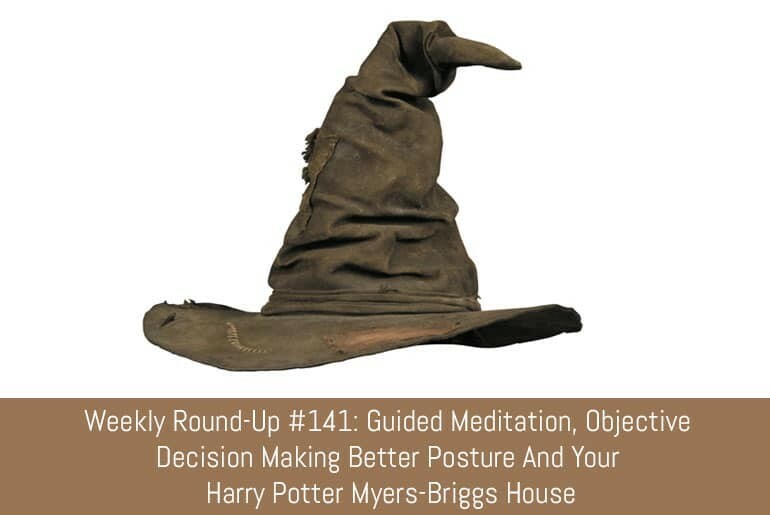 This week we learn to reduce stress with guided meditation, work on our posture, make some objective decisions and figure out what Harry Potter house we’d be in based on our Myers-Briggs score! We all know that the workplace can be a rather stressful place and that there’s a lot going on but the guys at Sage suggest that we try to take a bit of a break and meditate while at work. Meditation can reduce stress, help with your general health and make you more productive so plug in your headphones and spend 10 minutes being guided through your first meditation session. The internet is a wonderful thing, but when it comes to finding academic style papers and reports it can be quite difficult to get the type of information you need from reliable (and citable) sources. Knowtro aims to address this by providing access to articles on a variety of topics such as Well Being, leadership and mindfullness. When making decisions it’s all to easy to go with your heart rather than your head but for some of life’s bigger decisions we often need to think a bit more logically rather than just going with our git instinct. This infographic from NetCredit gives you 9 simple tips to make objective decisions (they even give you an excuse to check out cat videos on YouTube! If you’re using OneDrive or DropBox, the thought of moving to [Google Drive](https://drive.google.com] a but daunting. This article from Cloudwards covers all the basics on how to set up Drive on your computer and how to get your files into the cloud. Sitting at a desk all day can play havoc with your back and posture. I often catch myself slumping rather than having a nice straight back and strong core. PHW gives you 7 simple Yoga poses you can use to work on your posture and ease out those kinks – and remember once you start using these your posture will soon become a lot better without you having to concentrate on it. If you’re not familiar with Yoga, the post does try to explain how to perform the various poses but you may want to check out the Yoga Journal’s list of yoga poses which has information on all of the poses in the article, a step by step guide and a video showing how you should be performing the pose. If you have a small pantry that your could do with some extra space in it, and have a lot of bags of crisps to store in it, you’re bound to find a handy tip here – and your shower caddy doesn’t have to be used only in the shower either! Keeping up with new skills to get ahead at work, or just because you like to learn new stuff can be an expensive job – but now you don’t have an excuse not to learn some new stuff thanks to Mashable’s list of 20 courses undr $20. From an Mini MBA to learning to code, there’s bound to be a course to interest you and it won’t break the bank either. Lifehack is touting this “new” system as and alternative to bullet journaling. There are 4 parts to the system which can be used in a Lite, Standard and Pro way with each level adding a new feature. I have to say, I don’t think the “Strikethru” system is a lot different to the way I adapted GTD back in 2007 (probably before that thinking about it). I really need to get a decent name for my system I guess so I can start a Kickstarter! The advantage of my system is that you can use any notebook or paper so it’s really flexible. You can read all about my “Killer Getting Things Done Setup here” I’m still using a similar system 10 years on so it must be working! Hello, my name is Katy and I am a notebook hoarder! I currently have a drawer full of notebooks that I am doing nothing with and bought a couple more just a few weeks ago! If you’re like me and you buy lovely notebooks then struggle with what to use them for the Mae-Mae over at Our Journey In Journals has some great ideas on how to put them to good use. I especially like the idea of avent journal – I could really use that after some of the days I have! If you’re interested in Bullet Journalling but are tied to technology and don’t want to switch over to paper the the guys over at the Trello blog have written a great guide on how to Bullet Journal using Trello. I’m a big fan of batch processing tasks (I wrote about it way back in 2008 and revisited how I batch tasks in 2017). Emily from My Adaptable Career agrees with me and gives you some great reasons why Batching is the way to go when blogging (or doing any other task really). If you’re not familiar with the Myers Briggs Test then it’s a way of categorising personality types depending on how much you lean towards certain criteria. There’re four main categories of type: Analyst, Diplomat, Sential and Explorer, with 4 sub-types to each group. You can find out your Myers-Briggs score for free at 16 personalities, it’s worth periodically retaking the test as your score can change. I just took the test and got INFJ-A, Whereas in 2007 I was ENTJ and in 2006 I was ISFJ! Anyway, my Harry Potter house is apparently Hufflepuff, do you think your Myers-Brigs has sorted you into the right house? Let us know in the comments! On final bit of Friday fun for you. Make your perfect omelette and Buzzfeed will let you know if you’re a morning person or not. I got “Not about the morning. No one better wake you before 1 p.m.” – how scarily accurate is that! I hope you have a great weekend, as always if you have any links you like to share with me and my readers please contact me through the website or send me a tweet.